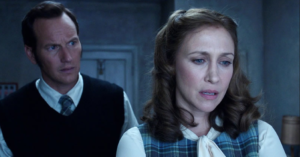 Unlike the first film, The Conjuring 2 takes an increasingly lengthy time to get to the haunting. Instead, viewers are treated with two parallel stories; that of paranormal investigators Ed and Lorraine, and the Hodgson household, who begin experiencing frightful events by way of their daughter Janet (Madison Wolfe). Wan seems to have grown even fonder of his character since last seen onscreen, and this emphasis on character manages to break up the monotony of a typical horror formula. Wilson and Farmiga, meanwhile, are more than capable performers, bringing a quiet intensity to their respective role that feels very appropriate to their traumatic profession. The only hitch in this risky plot transgression is that it is indulged in for a bit too long, sparking a bit of restlessness in the viewer before the Warrens finally decide to link up with the Hodgsons. The film truly begins to take shape when the married duo finally enters the house. Here, amidst a little girl with a gravelly voice and religious iconography, Wan showcases precisely why he’s become the successor to the horror film mantle. Upside down crosses, jump scares, and outright creepy imagery are hallmarks of the haunted house subgenre, but Wan wields these tools with such precision that a true sense of fear is often restored to a jaded scary movie audience. It isn’t so much in what’s shown, but when and how it is shown, and the acclaimed filmmaker clearly has no issues when it comes to exorcisms and eerie figures in the hallway. Granted, nothing as iconic as the clapping game from the first film appears, but worthy of applause nonetheless.